His Holiness Kyabgon Gongma Trichen Rinpoche is the supreme head of the Sakya School, which is one of the four main schools of Tibetan Buddhism. Born in Tibet in 1945, His Holiness belongs to the ancient and distinguished Khön family, whose history extends back to the early days of Tibet, before the arrival of Buddhism. His Holiness Kyabgon Gongma Trizen Rinpoche is the eldest son of His Holiness Kyabgon Gongma Trichen Rinpoche and a member of Tibet’s noble Khon family who founded the Sakya Order in the eleventh and twelfth centuries. Since early childhood, he has brilliantly accomplished the intensive traditional training required of lineage holders. His training now complete, he teaches widely as a master of both the esoteric and exoteric traditions of Buddhist philosophy and meditation. He is well known for the brilliance and clarity of his teachings and his fluency and excellent command of English. For a complete biography of His Holiness Kyabgon Gongma Trizen Rinpoche (told in his own words), as well as information on the Sakya Lineage of Tibetan Buddism in general, please visit the Sakya Centre website. His Eminence Gyana Vajra Rinpoche is a senior lineage holder of the Sakya Order of Tibetan Buddhism, and the younger son of His Holiness Sakya Trizin. He received decades of rigorous training from His Holiness himself, as well as many other great masters includes lamas such as H.E. 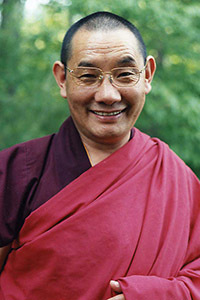 Chogye Trichen Rinpoche, H.E. Luding Khen Rinpoche, The Very Venerable Khenpo Appey Rinpoche, and the late Khenpo Migmar Rinpoche. H.E. 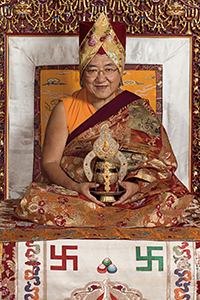 Gyana Vajra Rinpoche completed his ritual training at Sakya Monastery and his philosophical training at Sakya College. For additional biographical detail, as well as information on the Sakya Lineage of Tibetan Buddism in general, please visit the Sakya Centre website. Venerable Khenpo Kalsang Gyaltsen is Abbot and Vice President of Tsechen Kunchab Ling. 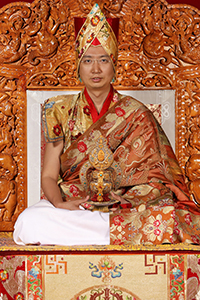 He established the temple in 2001 at the advice of His Holiness the Sakya Trizin as His Holiness’ Temple Seat in the United States, courageously and skillfully carrying out His Holiness’ intentions in identifying and renovating the property, constructing a beautiful temple, gathering a monastic sangha, and developing and teaching the daily religious and cultural programs there. 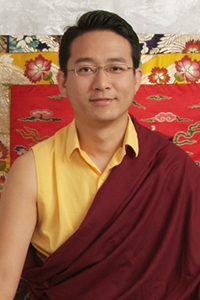 Venerable Khenpo Kalsang is also spiritual director of Sakya Phuntsok Ling Centers for Tibetan Buddhist Study and Meditation in Silver Spring, Maryland and several other branches of Tsechen Kunchab Ling throughout the country. He is a widely recognized and accomplished teacher and translator of Buddhism. His Holiness the Sakya Trizin and other high lamas of the Sakya Order have repeatedly praised his Dharma activities as exemplary.